HM The Queen and HRH the Duke of Edinburgh have visited an art installation that marks the Centenary of the First World War. The Royal pair toured the exhibit, featuring thousands of ceramic poppies, at the Tower of London. The Queen laid a wreath at the Blood Swept Lands And Seas Of Red exhibit, where each poppy commemorates a fallen First World War serviceman. By 11 November, Armistice Day, there will be 888,246 ceramic poppies, one for each British and colonial death. More than 1,600 men enlisted at the Tower of London and it also served as a military depot and the execution spot for 11 German spies. 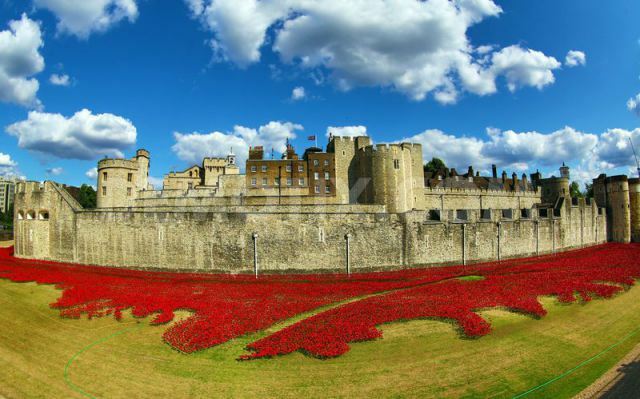 Artist Paul Cummins, who created the ceramic poppy field, said: ‘I approached the tower as the ideal setting as its strong military links seemed to resonate. ‘The installation is transient, I found this poignant and reflective of human life, like those who lost their lives during the First World War. This entry was posted in Events and tagged 1914-1918, Artist Paul Cummins, Centenary News, ceramic poppies, First World War Centenary, news, The Queen, Tower of London, UK News, WW1. Bookmark the permalink.